Yesterday afternoon (Tuesday) I decided to take a quick run to Starbucks to get a matcha latte when I heard a voice behind me say, “Hello, Father Moki,” and when I turned around to see who it was, I saw a young lady in green scrubs and then realized that it was one of my fourth-grade students from the Priory who is now a senior. When I asked her where she was going and why she was dressed like a doctor, she told me that she was heading downtown to do her internship at a veterinary clinic. It turns out that she has a dream to become a veterinarian one day because she likes animals and I found it remarkable that the school set it up so that their students can live into their dreams. It was a beautiful thing and I was proud not only if her, but also to have taken part in it somehow, perhaps by encouraging her when she was my student eight years ago. That was one of the greatest rewards of being a teacher – encouraging people and sending them off to grow into their dreams. And now it’s interesting for me to still be a part of the story several years later and to see the outcomes of the relationships that I had with my students, many of whom are grown up, have graduated from college, and have started families of their own. As we enter into Advent, we have the opportunity to look back and reflect upon what we’ve done as a Cathedral community so that we can offer the gift of that to the Christ child when he appears in our midst – most especially in our hearts. We have our Mahalo! dinner coming up on Saturday at 6:00 PM in Davies Hall. Those of you who have turned in pledge commitments to the Cathedral for 2019 are invited and should have received an invitation from me via email or snail mail. It is not too late to RSVP, so please remember to let me know if you will be attending. Uli Cutter has worked tirelessly to put this dinner together and it is sure to be a wonderful evening of fellowship and good food. The Cathedral Chapter met yesterday evening and approved the October 2018 minutes, financials, and Treasurer’s report. They are attached here for your review and ready reference. The Chapter was especially pleased to have Bishop Fitzpatrick join us and we had a good and fruitful meeting where we reviewed the first draft of a budget for 2019. Things look promising and our challenge is to address a small deficit in the budget in the amount of $31,000, which I am confident can be mitigated by additional pledge commitments that I hope will come in. If you plan to make a pledge commitment to the Cathedral, your letting us know what the commitment might be will greatly help in our budget planning process. We had a wonderful Feast Day of the Holy Sovereigns this past Sunday. 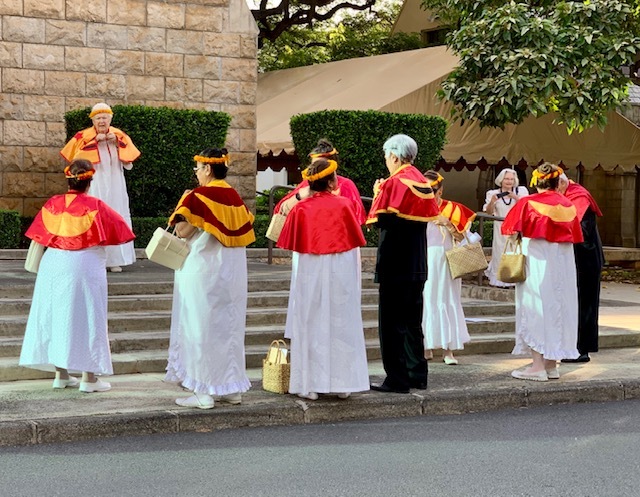 All three services used the readings assigned from the Lectionary to King Kamehameha IV and Queen Emma and we had the additional honor of having the Royal Civic Societies join us at the 8:00 service. 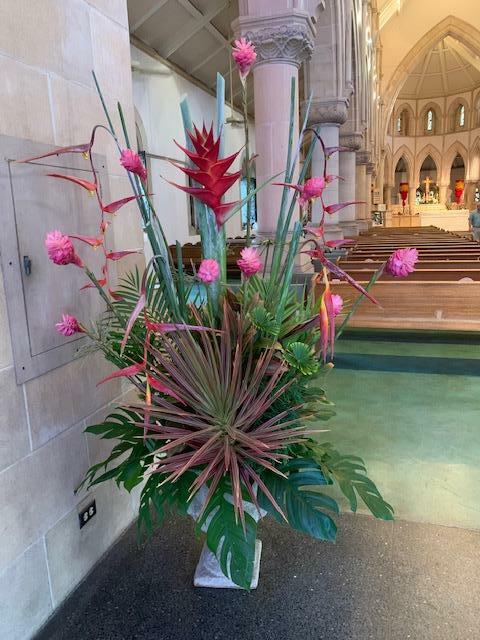 The Cathedral sanctuary looked absolutely gorgeous, because of those who came in the day before and created beautiful floral arrangements, and I received many compliments on the music and the choir that morning. I am including a couple of photos. Yesterday afternoon I had a meeting with Jazzy Bostock from St. Peter’s and Darrell Whitaker from Camp Mokuleia. They have been working together to do a weeklong camp for children in downtown Honolulu as an alternative to an extended summer camp stay up on the North Shore, which they will also offer. The Cathedral was asked to become involved by providing space for the games and activities as well as worship. I wholeheartedly agreed to collaborate not only with St. Peter’s and the Camp, but also with St. Paul’s, who has agreed to provide worship space for the week. This will begin on June 17 and I am excited not only about seeing children on the Cathedral promises, but also working together and collaborating with other entities on Queen Emma Square. Please remember that this coming Friday, November 30 at 5:30 PM we will host the Kirkin’ if the Tartan in the Cathedral sanctuary. This Evensong is an an opportunity for people of Scottish heritage to come and have their family tartans blessed. It will include bagpipe music, which is especially beautiful to hear with the acoustics in our Cathedral. 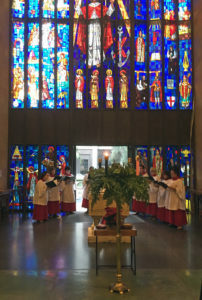 Please also remember that on Sunday, December 9 at 5:30 PM we will have an Advent Processional in the Cathedral sanctuary. This is a service that Todd Beckham put together last year and those that attended commented over and over again how beautiful they thought it was and how they wish more people had been there to experience it. I really encourage you to attend this beautiful service and to take part in the Cathedral’s being gradually lit up as the choir processes closer and closer to the high altar. The idea behind all of it is that we slowly, patiently, and prayerfully approach the Christ light in our midst and it sets a wonderful tone for the Christmas season. Please consider joining us. 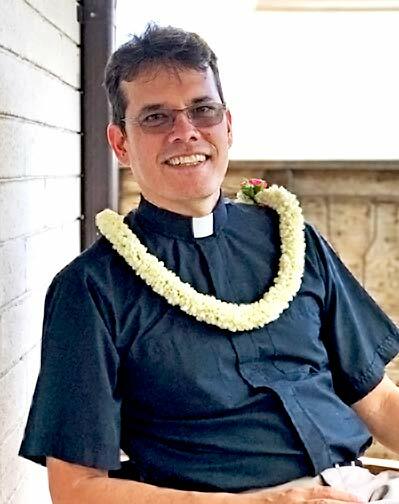 After the 11:30 Eucharist in the Cathedral this morning, I will be heading off to Hilo to spend some time with my family on the big Island. I will be back in Honolulu on Friday afternoon and will be at the Kirkin’ of the Tartan at 5:30. I look forward to seeing all of you sometime this weekend-at worship and at our stewardship dinner. Until then, please take care.